Picking a riding facility can be an overwhelming task. There are so many places to choose from and so many questions to ask. How do you know it's the right place before you invest your time and money? Can I just trail ride? Do you give guided trail rides? 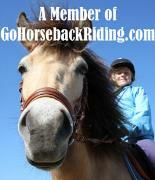 We do not do trail rides to the general public, but we do have opportunities within our lessons to go on trail rides. Can I rent a horse? Do you lease horses? We do not rent horses to the general public, but we do offer Equi-Lease and we do lease a few of our higher level school horses to our students. Do you do birthday parties? Now, we do not do birthday parties. We have a large lesson program that requires the use of all our school horses. Do you board horses or are just a lesson barn? Our focus is being a lesson barn, but we do board horses for our students. All boarders are required to take lessons. You can check out our Boarding Page for more details. Are dogs allowed on the premises? Yes, dogs are allowed to be brought to the barn with some guidelines. They must remain on a leash at all times. They must be dog, human (adult & child), and horse friendly. They must remain with you at all times and not tied near the rings. At no time are dogs allowed to be kept in a vehicle. Should I buy a horse for my child when starting lessons? Your child is going to learn a lot their first year of riding and the level of the horse or pony will change frequently, so we do recommend waiting at least a year before purchasing your first horse or pony. Are you insured? Yes, we are insured. You will still be required to fill out a release agreement stating that should emergency medical treatment be required, your own accident/medical insurance company shall pay for all such incurred expenses and that you release the barn from legal liability. Do you offer other horse related activities? We offer several opportunities throughout the year to get more involved with the barn and horses. There are several activities such as the barn parties, shows, and show teams to get involved with. Do you offer the option to show? We offer In-house shows, hunter/jumper schooling shows, dressage shows, the Timex horse trial, and a few summer Just Jumper shows. We also have the Dressage Team, Hunter/Jumper Team, Event Team, and Pre-Event team that will attend shows off the premises. Do you offer camps throughout the year? We are well known for having the best camps in the area. We offer summer camps, winter break camps, spring break camps, and daily camps for when the kids are out of school. All of our camps are "day-time" camps, not sleep over camps. How do I get started? You can start by contacting us or coming to our Introductory Lesson. You will then have a chance to see the facility and meet some of the staff as well as a few school horses before making any decisions. How much are lessons? What are your lesson packages available? A group lesson costs around $45 per class and comes in 13 week packages. We also offer private and semi-private lessons as well as extra team lessons. See our Lessons Page for more details. Do you offer family, group, or military discounts? We do offer a family discount with 3 or more members for lessons and camp. We do not however offer discounts for groups or the military. What do I need to wear or bring with me? An ASTM/SEI certified helmet, pair of flat soled boots with a ¼” to ½” heel, and fitted pants or jeans are required when starting out. Riding gloves, crop, and riding jodhpurs are also suggested during the 1st 13 weeks. You will want to dress in “zip-up” layers during the winter and gloves, no scarves. You will want to remember to bring water and sunscreen during the summer months. It is also recommended to wear minimal jewelry. It can get caught in the tack and can be broken by the horse. Are helmets absolutely required? Can it just be a bicycle helmet? You will be required to have a properly fitted ASTM/SEI certified riding helmet. Bicycle helmets are great for when you are riding a bicycle, and just like when you are riding on horseback, should be used each ride. Bicycle helmets however are NOT suitable for horseback riding because they are designed to protect your head from the forces that occur in a fall from a bicycle. Most falls on a bicycle result in frontal or occipital head injuries, so the helmets have the most protection in those areas. Falls from a horse are usually from a greater height, and impacts can be on the front, top, back or side of the head, and because of this the helmet for horseback riding has more protection around the entire head. Another difference is that because of the likelihood of impact with a hard object such as a jump or a horse's hoof, the riding helmet is designed to take these factors into account whereas a bike helmet is not. Can I ride in tennis shoes? Even though tennis shoes and other closed toed shoes seem like they would protect your foot, they are not suitable for riding. Shoes with a flat sole are a serious safety hazard for any rider because the foot can slide forward through the stirrup and become entrapped... while in this precarious position, a person can easily lose their balance and fall. The result would be that the rider can be dragged or even stepped on by the horse causing serious injury to the rider. What is the Introductory Lesson? The Introductory Lesson gives you an opportunity to see the facility and meet some of the staff and a few school horses before you pay for lessons. There is no registration, but there are a limited amount of spots open. Riders must have a closed-toed shoe and pants. If you do not have a helmet, we can provide one for the lesson. 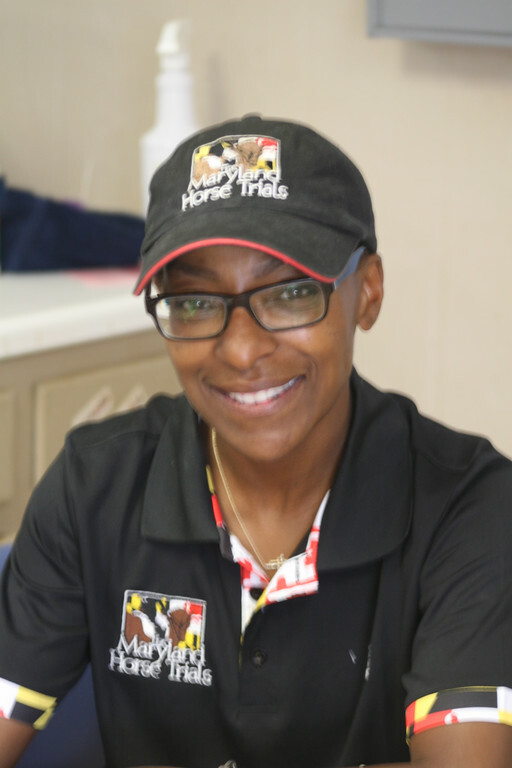 The instructor will cover some of the rules for being around horses as well as a safety check. Individuals with little to no experience will then mount onto a safe beginner horse that will be lead around. You will then be taught the basics stopping, going, steering, and how to hold your reins. You may even trot a little. Individuals with riding experience will be separated into a different group where you will walk, trot, and if you are ready, canter. You will also be asked to demonstrate the posting trot, jump position, and sitting trot. The Instructor may also have you go over a small jump. I’ve never ridden before, is that OK? This is perfectly fine. We take riders of all levels, from beginner through advanced. Everyone has to start somewhere. What should I expect for my first, ever horseback riding lesson? Lots of excitement! You will be nervous, excited, giddy, and maybe even a little fearful. This is normal. You will arrive 15 minutes early to check in. You will be greeted with a smile and shown where your horse is located. Someone will teach you how to bridle your horse and will help you to the ring. The Instructor will introduce themselves and the rest of the class and show you how to adjust your stirrups and tighten your girth. They will then help you mount and finish adjusting your stirrups. You will learn the basics of riding; just like the Introductory Lesson. You will practice this throughout the lesson. At the end, the instructor will bring everyone to the center and talk about what you have learned, what you will work on next week, and some of the upcoming events. They will then help you dismount. You will return to the barn and unbridle your horse. You are finished and will have a big smile on your face. We can’t wait to see you again next week! Will I need to catch and tack my own horse? For the well-being of the horses, we have all the horses already groomed and tacked for the evening and weekend lessons. It is better for the horse’s back to have a saddle sitting on their backs for a couple of hours versus someone constantly putting it on and taking it off. We do however allow our “daytime” students to groom and tack their horses. It is usually much slower during this time. Very rarely will you have to catch a horse for a lesson. For those that want to groom and tack, we do offer a working student program where our students volunteer their time and in return, get more riding time. What will I learn in the 1st 13 weeks? What is covered in the 13 weeks depends in large part on the group. By the end of the 1st 13 weeks, most classes can post the trot in a group, go over trotting poles and a small cross-rail in 2-point, and have cantered one at a time in 2-point a few times. Do I get to trot in the 1st lesson? How long before I get to canter? When do I get to jump? All of our beginner students will trot in their 1st lesson; usually from point “A” to point “B”. After learning how to post, they will then be introduced to the 2-point position for jumping and their 1st canter. Most of the students will jump a small cross-rail and do their 1st canter by then end of their 1st 13 weeks. How are the classes divided? Will I be with other riders at my level or age? We do separate the classes by age and ability. 5 - 7 year old riders are placed into our Pony Pal classes. The parents will learn how to lead. It is a great bonding time for parent and child. Once they reach the age of 8, they will be placed into our “children’s” classes. The ages range from 8 to 16. The adults are placed in their own groups. We also separate the groups by level. The levels are beginner (C/A1 or C/A1+), intermediate (C/A2 or C/A2+), advanced (C/A3 or C/A3+). What is the starting age for lessons? Should I let my 5 year old do lessons? Am I too old to start learning how to ride? We offer lessons for 5 – 95. The younger riders will be placed into Pony Pal classes where their parent will be taught to lead them. We also have several mature adults (young at heart) who also start riding later in life. It is never too late to start. Most people ride to relax and relieve stress. Come add years to your life! How many riders are in a class? The beginner classes typically have 4 - 6 students; some of the more advanced classes can have up to 8 riders. How many days a week do you do lessons? We are open 7 days a week. We will have different level classes offered every day of the week. How often are the lessons? How long are the lessons? Each group lesson is scheduled on the same day at the same time every week for one hour. So, once a week at the same time. Semi-private lessons are also 1 hour long and private lessons are for 45 minutes. What if I miss a lesson? We have a very liberal make-up policy. Please, notify the office of any absence. Riders missing a class have the entire 13 weeks to make up their lesson. Riders that frequently miss a lesson without calling will be charged that lesson. Do you have lessons when it rains or snows? Yes, we typically do hold our lessons in the rain and snow. Feel free to call the barn or check our web-site, Facebook, and Twitter before coming to your lesson. We do not follow the school system. Simply call ahead to schedule a make-up lesson if you choose to not ride in the bad weather. Will I need to supply my own horse or equipment? No, we supply you with a well-trained lesson horse and all the required tack and equipment. Some of our students like to purchase their own stirrup leathers and irons to ride in. Will my child ride a horse or pony? We frequently use ponies and small horses for our Pony Pal riders, but size of the horse is not necessarily an indicator of how well behaved the horse is. We prefer a sweet temperament, using slow and calm horses for our beginner riders. What disciplines or style of riding do you offer? We start our beginner students in BALANCE SEAT, an English form of riding. We quickly introduce the 2-point position, otherwise known as the ½ seat or jump position. As our riders progress, they will then learn the sitting trot and hunt seat (aka: light seat or 3-point.) Once our riders are balanced and have some experience, we offer more specialized lessons in dressage, eventing, hunters, equitation, and jumpers. For the less serious rider, we continue to teach pleasure riding. Will I be riding in a western saddle? We teach in an English saddle. Do you have a weight restriction for your riders? Do you have to be skinny to ride? No, we do not have a restriction, but we do take into account balance and safety issues. Riders must be able to mount and dismount without any assistance of the instructor or mounting block. We appreciate your understanding of this matter and for keeping our horse’s health in mind. How many lessons do you recommend or require a week? Most riders start off with a weekly lesson. We do have students that ride more than once a week. This is a personal choice depending on your needs and goals. But, do remember that muscle memory lasts for 3-4 days. Someone riding only once a week will take much longer then someone riding 2-3 times a week. Do you suggest private lessons to start out with? Maybe for someone that hasn’t ridden in a while so they can get their “horse” legs back before trying to keep up with a group lesson. But, for most it is fine to start in the group lessons. The group lessons build a comradery and friendship among the students. What if I am afraid? Being a little afraid is healthy and normal. You will have more self-preservation when riding. We will work with you to overcome any major fears and help build your confidence and understanding of horses. Through positive feedback and encouraging words, you will feel comfortable and relaxed around and on the horses. Is horseback riding safe? Yes, but you should know that horseback riding is considered a rugged adventure recreational sport activity. There are numerous obvious and non-obvious inherent risks always present in such activity despite all safety precautions. It is our goal to provide a safe, suitable mount appropriate for you to learn and enjoy horseback riding on. Will I fall? Yes, at some point everyone will have an “unexpected dismount”. If a rider falls from a horse to the ground, it will generally be a distance of 3 ½ to 5 ½ feet and the impact may result in injury to the rider. Falls are inevitable, but we take every precaution necessary with our lessons to ensure that a minimal amount of falls occur. This is one reason why a properly fitted approved ASTM/SEI certified riding helmet, proper attire, and footwear is required. 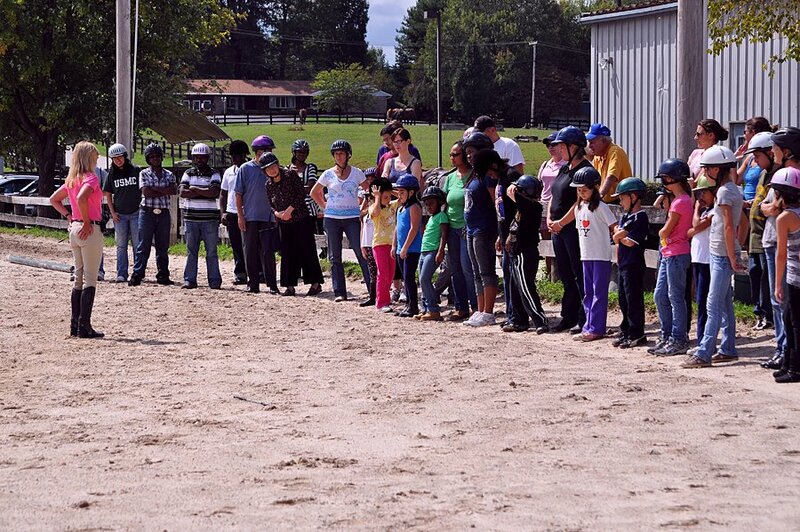 We also have certain safety plans in effect for our lesson program as well as well-trained school horses. What are the benefits of riding? Who likes working out at the gym? Why would you when you can ride and spend some time on a horse. Horseback riding is great for the body. Riding works with several muscle groups while giving you that much needed stress relief. It is not only good for the heart, but it is good for the soul and mind. It adds years to our lives. For those that like being with nature on a beautiful day and enjoy a warm spring breeze, then horseback riding is for you. From working those muscles, building your cardio, and simply enjoying life; the benefits of horseback riding are priceless. How long does it take to learn how to ride a horse? Well, that depends on your personal goals, athleticism, and ability to understand the movement of the horse. Most riders are not comfortable riding by themselves for at least one year after starting lessons. You will also learn very quickly, that it is a never-ending process. There are not too many sports out there that require a person to sit on an animal with a mind of its own and have to find a way to convince that animal to listen. They are not bicycles. How experienced are the instructors and are they certified? Our instructors have extensive training in many riding disciplines such as balance seat, pleasure riding, dressage, hunt seat, eventing, and jumpers. All instructors are required and have been certified through Mike Smith’s Instructor School. Training continues on an on-going basis to keep our lesson plans fresh, fun, and educational. What is your philosophy on teaching? We understand that the most important aspect is “safety first”. We also want our students to have fun while learning to ride, whether they are beginner riders or our most advanced students. We are dedicated to the art of horseback riding and are thrilled to share our love for all things equestrian with our students. Everyone takes much pride in their teaching and wants to help each student to achieve their individual riding goals. It takes a team to offer such exceptional service. Is the Instruction kind, supportive, and enthusiastic? Our philosophy of teaching is to be supportive, enthusiastic, and motivating. We understand that most of our students come to our barns to enjoy riding as a hobby and/or lower level competition; therefore they want to have a positive experience and trusting relationship with their instructor. Mike Smith instills in all his employees patience and kindness. He accepts nothing less. Are your horses calm and quiet? Yes, we choose our school horses for their calm disposition and sound basic training as is required for use for student riders and we follow a rigid safety program. Yet, no riding horse is a completely safe horse. Horseback riding is the only sport where one much smaller, weaker predator animal (human) tries to impose its will on and become one unit of movement with another much larger, stronger prey animal with a mind of its own (horse) and each has a limited understanding of the other. Do you have different level of horses for the different levels of riders? Having the right horse for each level of rider/lesson is important to us. We have the older, steady, unflappable horses for our beginners to begin their riding on, the athletic, bold horses for our more advance riders to compete, and everything in between. We pride ourselves on being able to offer all level of horses for our riders to achieve their goals. Are the horses healthy? All of our horses are on a well-balanced diet of hay and grain. They are routinely visited by the farrier and are on a regular vaccination schedule. They are limited to how many hours they can work and are given lots of TLC from the staff as well as our students. How many times a day do the horses get ridden? That depends on the horse as well as the lesson plan. Some of our younger, more energetic horses may work 4 to 5 times a day, while some of our older horses will be more limited. A horse assigned to lower level classes may also go more frequently than a horse going into a few jumping lessons. Do you provide breaks for them? No horse is allowed to go more than 2 hours in a row without a break. We want our horses to have a break and be fresh for their next lesson. The horses are also required to go back for a drink in between lessons on the hotter days. How old are the school horses? We have horses of all ages for our students. Maintaining a balance ensures us a diverse group of horses for our student’s needs and wants. Do horses like to be ridden? I think like most of us, we would rather be playing or hanging at home relaxing. Same with the horses; they would prefer to be in their stalls eating hay or playing in the field with their friends. But, they do like the companionship of humans. They like to please and want a job. In return, we give them treats and lots of affection. They certainly appreciate that. Can we give the horses treats? Bribery is a wonderful tool when it comes to horses. They do like getting carrots, apples, peppermints, sugar cubes, and regular horse treats. Rewarding them for working hard for you is always encouraged. You can always put the treats into their food buckets. Are the barns clean and organized? The stalls are cleaned on a daily basis. The horses are given fresh water throughout the day. We have regular staff as well as volunteers to help maintain the cleanliness of the barn and surrounding areas. What is the age group of students riding? We have all ages of riders. We have the Pony Pal classes that are for ages 5-7, children’s classes for ages 8-16, and adult classes. The adult classes are usually later in the evening, while the children’s classes are early evening. We promote riding for all ages. It is never too late to start riding. How many students are riding? It would be hard to believe, but we have around 400 students that visit us on a weekly basis. The barn is very sociable and many of our students become close friends that will do activities outside of the barn together. There is always a smiling face to great you as you walk down the driveway. We have a sense of family and enjoy spending time together. Where do we ride? We have 2 large indoor rings and 2 large outdoor rings along with fields and trails. Depending on the lesson plan and weather, you will ride in any of these areas. We have a board just inside our school aisle that you can check to see where your lesson is located. Am I allowed to tour the barn or watch a lesson? You are always welcome to walk around the barns or watch a lesson during regular barn hours, Monday - Friday, 9:00 - 9:00 and Saturday - Sunday, 9:00 - 6:00. We also suggest coming to the Introductory Lesson that we hold on a weekly basis. Looking for more information or want to stay more connected?